I’ve noticed that most books about Indianapolis history – or at least the accurate ones – tend to focus on events that actually happened. But sometimes it’s more interesting to read about those things that might have happened – the near-misses and what ifs that cause a collective sigh of relief when we realize how close our city came to becoming something other than what it is today. For example, if city planners of the 1950s had their way, visitors to tomorrow’s Super Bowl would encounter a much different downtown Indianapolis. 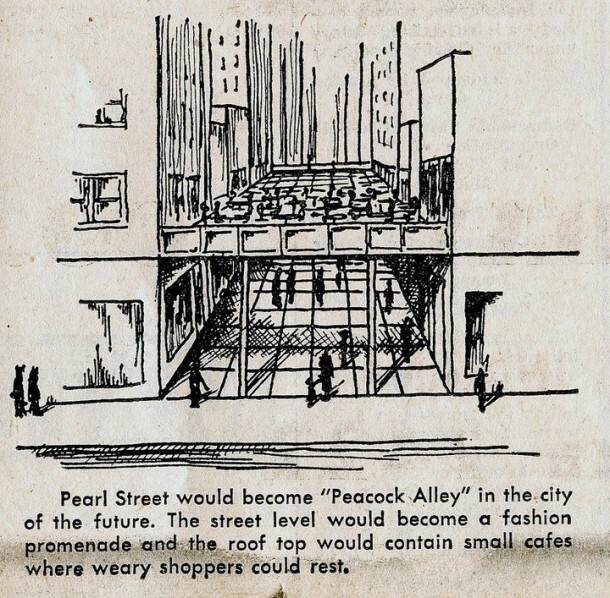 Children would frolic in a 13-acre amusement park, helicopters would land every 15 minutes at the site of the former Union Station, and revelers on Georgia Street would have no difficulty finding a parking space because the entire block would be converted into a giant parking garage. 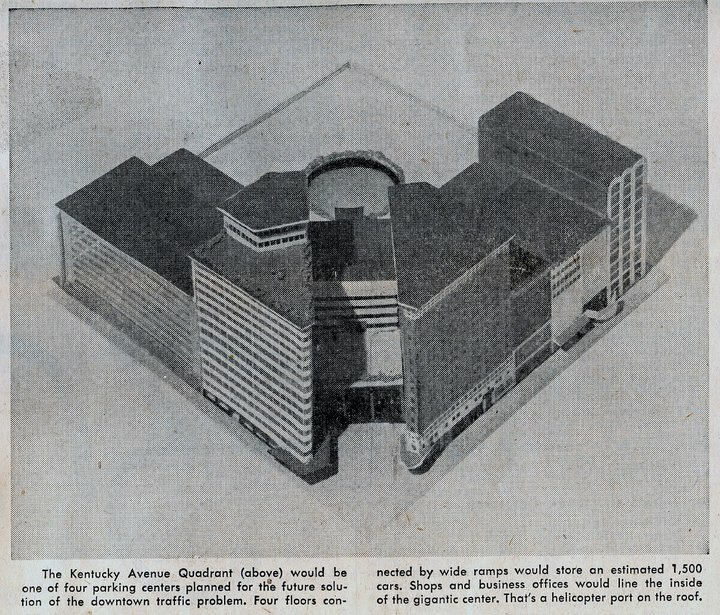 In a 1958 plan released by the Metropolitan Planning Department, Union Station would be demolished and replaced with a "modern" transportation hub, including helicopters ferrying residents from Broad Ripple. 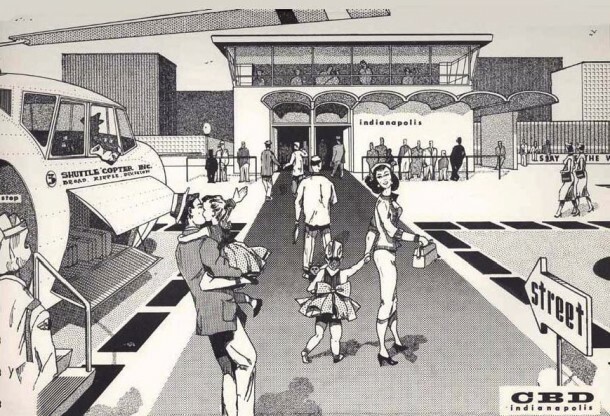 In a 1958 plan released by the Metropolitan Planning Department, Union Station would be demolished and replaced with a “modern” transportation hub, including helicopters ferrying residents from Broad Ripple. Some of the most intriguing plans that never made it off the drawing board were hatched in the 1950s, a time of explosive post-war growth. Although it would be years before Mayor Bill Hudnut said “You can’t be a suburb of nothing,” city leaders were becoming increasingly anxious as they watched the once-thriving downtown disappear down the donut hole. The Crossroads of America plan was the first and arguably the most ambitious of the post-war downtown redevelopment schemes. In the making since 1945, the Crossroads plan was unveiled in September 1953 in a special edition of The Indianapolis Star. I was lucky enough to find a copy at a flea market. 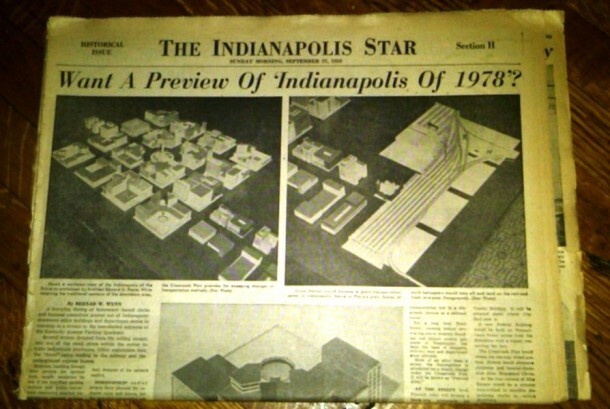 “Want a Preview of Indianapolis of 1978?” the headline screamed. Yikes. I lived through the Blizzard of 78, and also personally witnessed a lot of really bad disco dancing in 1978. So it was with some trepidation that I opened the newspaper to go back to the future (or at least what was the future in 1953). 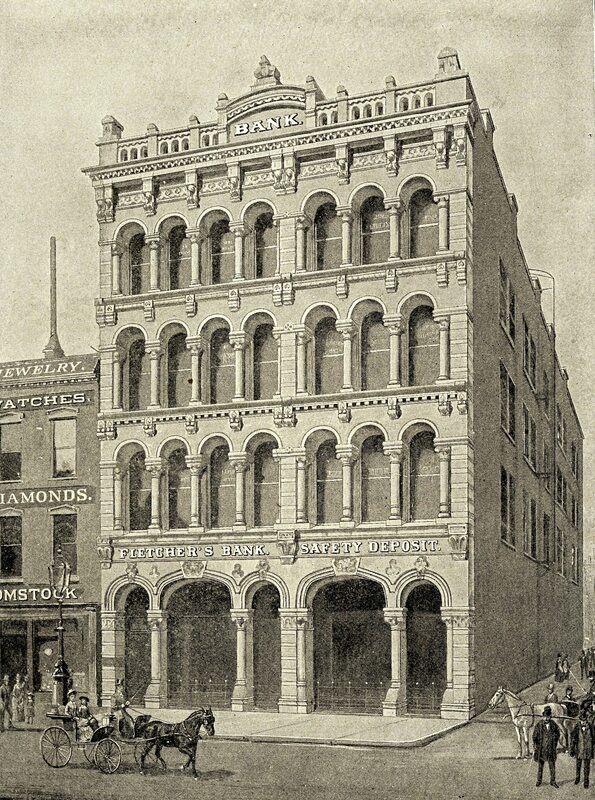 In celebration of its 100th anniversary, the now defunct L. Strauss & Co. store had commissioned architect Edward Pierre to design a vision of the city 25 years in the future. Above on the right is a rendering of Union Station, which would become a giant transportation center, complete with a helipad on the railroad overpass. To solve the growing parking problem in the Mile Square, the Crossroads plan called for the construction of four gigantic parking centers capable of holding 1,500 cars at the entrance to each diagonal street. Each quadrant would then be retooled with a special focus — Indiana Avenue would become the entertainment hub, Kentucky Avenue would focus on business and hotels, Virginia Avenue would become a mini-Wall Street, and Massachusetts Avenue would house medical offices. A subway would connect each quadrant to the rest of downtown. 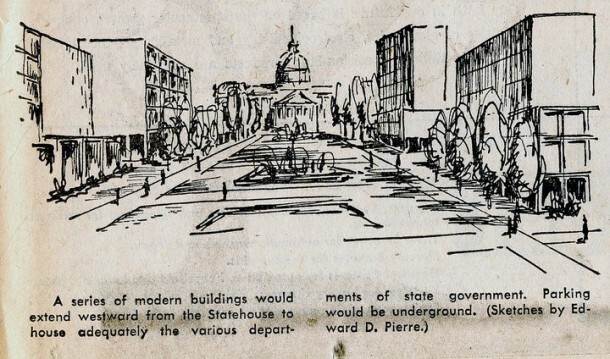 To alleviate Statehouse overcrowding, the Crossroads plan provided for a mall surrounded by government buildings on the west side of the Statehouse. This vision was partially realized in the 1990s with the completion of the State Office Building complex. Of all the ideas in the Crossroads plan, Lockerbie Fair was the one that generated the most serious discussion by city planners. Pierre first conceived the idea for a Victorian-era theme park in 1936, and support for the project continued to build over the next two decades. In 1960, Mayor Charles Boswell declared that redevelopment of the decrepit Lockerbie neighborhood into a “national tourist mecca and playground” was the top priority of his administration. 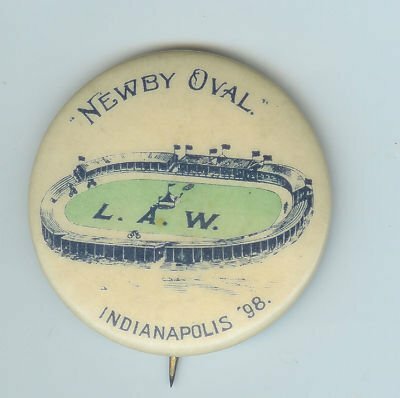 Last summer, I went to an estate auction on the northwest side of Indianapolis. The auctioneers were selling the property of the late Robert Braun, who served from 1969 to 1972 as the first executive director of the Historic Landmarks Foundation. From my perspective as an Indianapolis history buff, it was the perfect way to spend a Saturday. Windows, doors and terra cotta salvaged from long-gone buildings were stacked along the driveway, and tables in the yard were piled high with old books and other documents about Indianapolis. 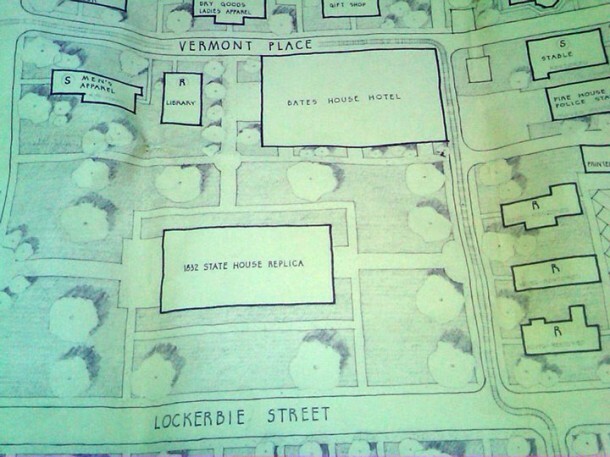 At the bottom of a pile of old prints and documents, I found detailed renderings for Lockerbie Fair. 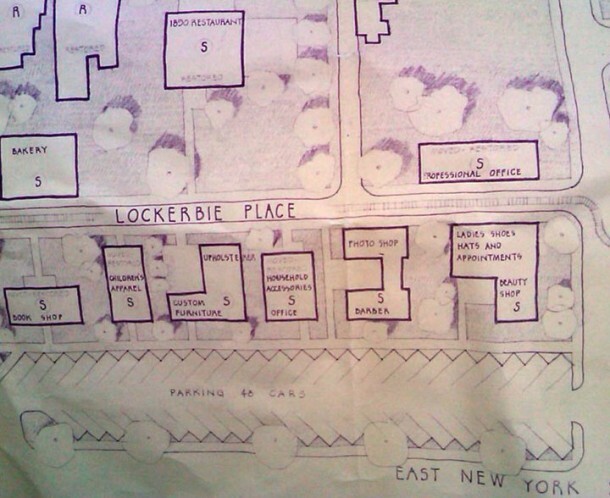 Under this version of the Lockerbie Fair proposal, the historic houses fronting New York Street would be torn down or moved, with the entire area replaced by a massive parking lot. 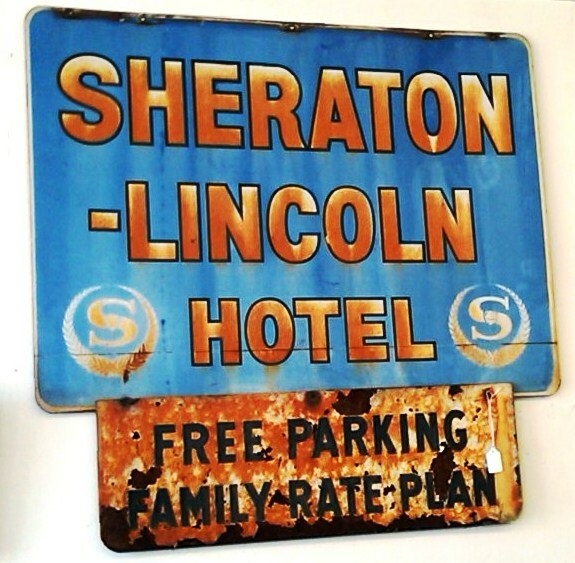 In addition to the Riley home, Lockerbie Fair would also feature replicas of Indianapolis’ original Statehouse and the Bates House hotel, where Abraham Lincoln spoke on the way to his first inaugural. The faux-19th century village would include an apothecary, gunsmith, candle maker and 1850s style restaurant, as well as modern amenities such as a photo shop and beauty parlor. No cars would be allowed; instead, tourists would travel by carriage. 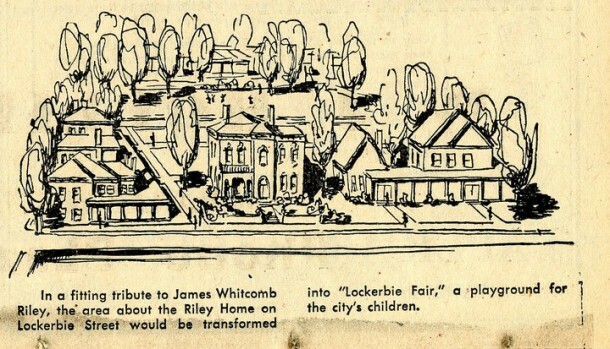 Lockerbie Fair was an integral component of a master plan for the central business district developed in 1958 by the then-new Marion County Metropolitan Planning Department. The futuristic plan called for razing large portions of the downtown where property values had plummeted and re-developing those areas through public and private projects. Other ideas included razing entire square blocks on the near-northside to build a village of high-rise apartments, and replacing the old Union Station with a modern heliport and transportation hub. Although it would be eight more years until the NFL held its first Super Bowl, city planners in 1958 did come up with one idea that was surprisingly prescient. Under the master plan, entire blocks between Maryland and Georgia Streets would be converted into parking garages surrounded by one-way streets. The planners called this concept a “vehicle island”. While lacking the charm of the historic structures that currently line the Super Bowl Village, a vehicle island or two would likely prove popular this weekend. 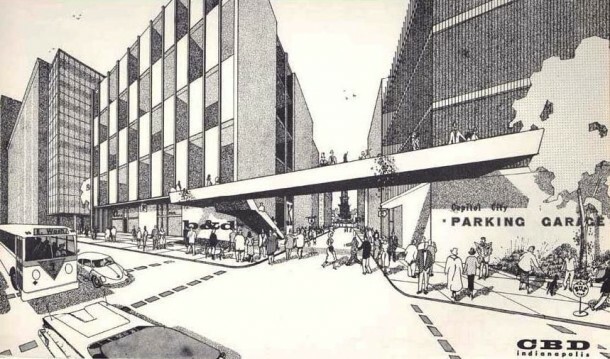 Thanks to the Internet – something that could not have been imagined by city planners in the 1950s – these futuristic plans have not been relegated to the dustbin of history. A scale model of Pierre’s Crossroads plan is now housed at Ball State University and may be viewed online by clicking here . 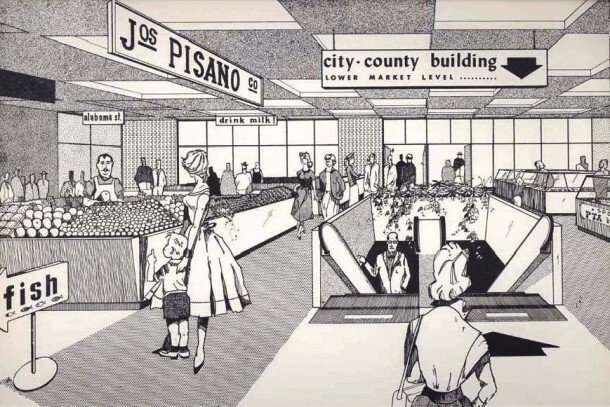 The 1958 Central Business Department Report is posted on the city’s website (hopefully not for future reference by city planners), and can be downloaded by clicking here. Obviously, Whittier had not seen these documents. Indianapolis Collected: Everyone Loves a Parade! The post WWII mindset was almost totally progressive and futuristic as regards new development. I clearly remember my parents having no love for anything “old.” To them old meant junk. The powers that were during the late 1940s and on into the 1960s were driven by much the same notion. That most of these ideas never came to fruition was likely due to money – or the lack of it. One literal “road not taken” which I believe is regrettable was the I69 extension to downtown. Planners knew that a great deal of suburban expansion was about to explode in the northeastern quadrant of Marion County and on into Hamilton County. The original plans for the Interstate system in Marion County included a northeastern leg which would have more or less followed what is now Binford Blvd. and on down to the “spaghetti bowl” However, a relatively small group of property owners along and near the planned route petitioned against it and won. Consequently, there has been and continues to be several significant bottlenecks which take place daily along the east leg of I70 and on through the I465 and I69 interchanges. I70 East and the interchange just east of Shadeland Ave with I465 has undergone numerous and very costly redesigns and expansions. Similar projects have been completed at the I465/I69 interchange, with yet another due to begin soon. Many of these projects may not have been necessary had the northeast leg been built as planned. How many hours have been lost sitting in traffic, and how many millions of dollars have been spent in what has so far been futile attempts at alleviating the traffic jams at various places along the I70 – I465 route? I’d counter with: how much more of our history would be lost. I for one, am disgusted by the level of sprawl here and think it has more than any other single factor, contributed to the decline of our city. Just my two cents. Back “in the day”, both Calvin Hamilton and F Ross Vogelgesang were in charge of planning in Indianapolis (Calvin Hamilton went on to a new career as Los Angeles’ Director of Planning) (Ross stuck around to take over in Indianapolis until he retired in the late 1970s) and did an outstanding job; except for rehabilitating Union Station as an intermodal center versus tearing it down, the 1958 Downtown Plan SHOULD have been implemented, at least in my opinion (for what that’s worth). What an interesting article, so glad these plans didn’t take place. I used to live in Indy and worked with your husband in the U.S. Senate office. It remains one of my favorite cities. This is a great blog! interesting that part of the old rail yards around Union Station did become the downtown heliport. Hard to criticize our forefathers for some of these plans. Many of these structures were 50 to 70 years old then. There are a lot of people now who would not shed a tear to see houses or buildings from the 40’s and 50’s torn down as not historically significant. Also hard to imagine where Indy would be if the interstates were not allowed to go downtown because of the historic damage they caused. I mourn those lost structures, but wonder how much gridlock we would have not to mention lost growth without the interstates. Some may recall that the original plan for Riley Towers included as many as eight or ten more buildings similar to the first two and was to cover several acres. 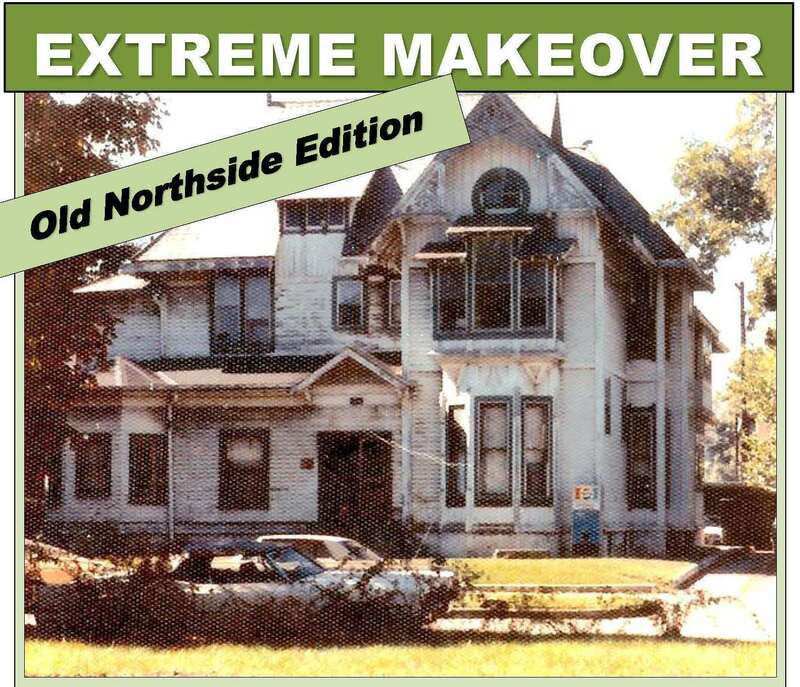 Think how many of the Old Northside/Chatham Arch homes would have been lost had that come to fruition. As to the situation regarding the I69 extension that was never built: No doubt some great old homes would have been lost had it been built as planned. But there are trad offs. The suburban sprawl that has taken place over the past 40 years or more throughout Marion County and beyond was inevitable. Cities grow. The intrusion of the inner-loop did do a great deal of damage to several neighborhoods. But imagine what traffic would be like on our city streets if the inner-loop didn’t exist? And public transportation has never been a viable option in Indy. I love the great old homes, and obviously many really great ones have been lost. Happily, though, with the restoration of a # of historical areas including the Old Northside, Chatham Arch, Fletcher Place, etc. a lot of the great old homes have been saved and have been restored to their original glory while being modernized for living in the 21st century. Again, there are trade offs. I’m certainly glad the Lockerbie plan did not come to fruition. My folks home would not have survived in the proposal. On another note, it’s 2012. Where’s my helicoptor? I enjoyed the article. Say hello to Mark for me. Libby, Dan Evans recently introduced me to your blog. In doing so he said he was such a fan of your writing that he a fan club for you. I am now an active member of the club’s Alpha Chapter. Thanks for this very well written and informative blog.